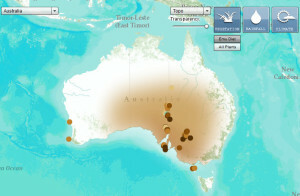 Explore a rich variety of fossil data with maps and trace the ecosystem as it collapses and rises over time with Walkabout through Time from the Carnegie Institute for Science. When people first came to Australia, about 55-60,000 years ago, the landscape was very different from today. The first Aboriginal settlers came from Indonesia, during a glacial period when sea levels were much lower than they are now. The distance between Australia and the northern islands could easily be crossed by primitive boats. Within only a few thousand years, people had settled along most of Australia’s vast coastlines as well as the interior that we know today as the Outback, a dry, hot extreme environment with limited plant and animal life. When humans first arrived, the continent was home to many species of giant marsupials, monotremes (mammals that give birth from eggs like the platypus),birds and lizards. These large beasts are called Megafauna.